NYSCF – Robertson Stem Cell Investigator Ravindra Majeti studies cancer stem cells in leukemia towards creating high quality and patient-specific treatments. 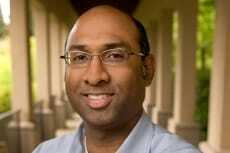 Dr. Majeti, Associate Professor in the Department of Medicine, Division of Hematology, and Institute for Stem Cell Biology and Regenerative Medicine at Stanford University, published a paper in Cell Stem Cell focusing on mutations in proteins identified in leukemias. These proteins, cohesins, play important roles in separating chromosomes during cell division and aid in DNA damage repair. Dr. Majeti’s recent study finds mutant cohesins block blood stem and progenitor cells from differentiation. The mutant cohesins associate with DNA and impair generation of new blood cells. Understanding the roles of aberrant molecules in disease gives researchers the power to create therapies to potentially reverse adverse conditions.